I passed through FIU today and I saw a group of men and women standing around golf carts in front of the stadium. They were holding large rolled up papers, and two men were holding what looked like large stadium construction plans. I'm assuming they were architects with the stadium drawings. I'm hoping so. I also noticed the wrap around that was up on the old bleachers was taken down. I think this is the first step in construction. As a former architecture major, I really get in to the construction of the stadium. I'll be tracking the construction closely. Really excited for the next 7 to 8 months... Let the building commence! Last edited by FIU Beisbol on Fri Feb 03, 2012 7:42 pm, edited 1 time in total. Thanks for the update, so is it just going to be bleachers or suites as well? According to multiple sources, the only phase of the construction to be completed for the beginning of the season will be the enclosure of the stadium. The new seats will be in and the stadium will be fully enclosed. Suites, a second stadium club atop the stadium, and press area will be held off until at least next season. any movement on the stadium??? anyone?? Sure, why not? Everyone else has. Seriously... when I interviewed Mario for the segment that aired tonight on SiriusXM, a good chunk of the interview had to get cut for timing purposes. One of the parts that got axed was when I asked about the stadium construction. Since we're not gonna air that part, I guess I can say what Mario told me about it. He didn't say a whole lot you haven't already read or seen in the press releases FIU's sent out... but he did confirm to me what FIU Beisbol has already said earlier in the thread. At the very least, the old north side will be completely gone and the stadium will be fully enclosed with the new bleacher seats by the time of the home opener in 2012. He said to me that things are progressing as scheduled on that front. Anything beyond that is, most likely, not gonna happen, at least not this season. Descendant of Red Sea pedestrians... raised on bistec empanizado... married to a Southern-fried redhead. 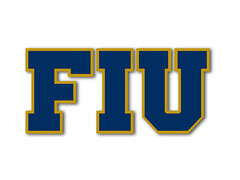 FIU football should market their program as "the I". No one ever said that only Miami can call themselves by one letter. On the last live blog with NT, pp did say when asked that it should being this month. But then again, its a public universitywith public funds so there is always snags that no one can control. according to sources I've talked to... FIU has the funds, we're just waiting for the final plans and drawings from the architects. This is why we haven't received season ticket holder renewal paperwork yet. They need to redraw the stadium seating and seating chart in the paperwork for the renewals. They are taking a long time to start, maybe they are waiting until after the spring game? Guys, remember that plans are being drawn up to not only include the enclosing of the stadium but how the future stadium plaza will be implemented into the new housing plans. "Special consideration was given to how this project relates to the stadium and the planned development of the stadium plaza. "- this was taken from the architects website. Now whether this warrants the delay in construction, I'm not sure. But if anyone caught President Rosenberg's interview on Radiate FM, he mentioned that construction should start any day this week. Hope this helps. Building A Dynasty, the 1995 reference may be partly correct in that it was the year that the then "Tamiami Stadium" was sort of "moved" from its original location in Tamiami Park a bit southeast of where it is now, to its present location which straddles the line between FIU and Tamiami Park. They also changed the configuration where at "Tamiami Stadium" the endzones were located north-south to its current configuration of east-west. At that time, they changed the name of the stadium to FIU Stadium, with all the upkeep, etc. now in the hands of FIU. I'm not 100% sure it was in 1995, but since they use that year, it very well may be. The "new" FIU Stadium was then opened in 2008. He was at a Tuesday game, I'm not sure Tuesday games are the best to gauge the atmosphere, but overall it's a pretty accurate review. The games with the best atmosphere last year were the Duke, UCF, and ULL games.